Shooting Star Shotgun Sports, LLC offers private shooting instruction by the hour. 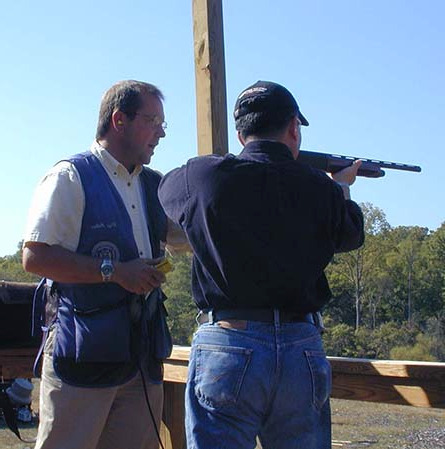 Our students learn proper shooting methods and techniques, resulting in more broken targets. Instruction by qualified instructors gets you there faster than discovering the secrets of shooting by yourself. We also work with serious sporting clay shooters who want to take their shooting to the next level. We also specialize in introducing young shooters to the shooting sports. We have the right size guns for every size shooter, and we work hard to keep everyone safe, comfortable, and having a great time. The minimum recommended age is 14. At Shooting Star Shotgun Sports, LLC, we always promise to provide the best instruction experience possible, and our amazing lessons can be given as gifts. Please contact us or read more to learn about our gift certificates. Our instruction is currently offered at $80 per hour for 1 student. We charge $10 more per hour for each additional person. Students also pay for the ammunition and targets that are used during the lesson. Gun rentals as well as gun safety equipment are provided at no charge. Shooting Star Shotgun Sports, LLC's minimum lesson time is 1.5 hours, and our weekend and holiday lessons last for 2 hours. Visa and MasterCard are accepted by the range. An average private lesson for (1) person is about $150. Two persons is about $200. To schedule a lesson or to just discuss your shooting, contact us via email or phone. We would like to hear from you.